BMW Motorrad is the motorcycle brand of the German company BMW, part of its Corporate and Brand Development division. BMW Motorrad has produced motorcycles since 1923, and achieved record sales for the fifth year in succession in 2015. With a total of 136,963 vehicles sold in 2015, BMW registered a 10.9% increase in sales in comparison with 2014. In May 2011, the 2,000,000th motorcycle produced by BMW Motorrad was an R1200GS. With the exception of the G310 series (which is produced at TVS's Tamil Nadu, India plant), all BMW Motorrad's motorcycle production takes place at its plant in Berlin, Germany. Some engines are manufactured in Austria, China, and Taiwan. Most of the current motorcycles in BMW Motorrad's range were designed by David Robb, who was the company's chief designer from 1993 to 2012 when he was replaced by Edgar Heinrich. The most popular model is the R1200GS and its sibling R1200GS Adventure, which sold 24,467 units – accounting for 28% of BMW's annual production. Current production includes a variety of shaft, chain, and belt driven models, with engines from 310 cc to 1,649 cc; and models designed for off-road, dual-purpose, sport, and touring activities. G series – single-cylinder engines of 449 to 652 cc capacity featuring chain drive. Models are G450X (now discontinued), G650GS, G650 Sertão, G650 Xmoto, G650 Xchallenge and G650 Xcountry. The 450 cc engines are manufactured by Kymco in Taiwan. The 2009 and 2010 650 cc engine parts were manufactured by Rotax in Austria, with the engine being assembled by Loncin Holdings, Ltd in China. Arriving in 2016, is the BMW G310R, a single-cylinder liquid-cooled model manufactured in India by TVS Motor Company. R series – twin-cylinder boxer engines of 1,170 cc capacity featuring shaft drive. Models are R1250GS, R1200GS, R1200R, R1200RT, R1200RS, R1200S and R nineT. BMW Motorrad achieved record sales for the fifth time in succession in 2015. With a total of 136,963 vehicles sold in 2015, BMW registered a 10.9% increase in sales in comparison with 2014. The biggest single market in 2015 was once again Germany (23,823 units), followed by the United States (16,501 units), France (12,550 units), Italy (11,150 units), United Kingdom (8,200 units) and Spain (7,976 units). With an aim for 2020 to supply 200,000 vehicles to customers, BMW Motorrad is targeting an increase of its dealership from around 1,100 to 1,500 in the future. As it was the case until now, BMW's most successful motorcycle is still the R 1200 GS with 23,681 units sold in 2015. BMW Motorrad regularly enters its motorcycles in the Dakar Rally, an annual car, truck, and motorcycle race held traditionally on European and African land and recently, in South America, has featured riders such as Simon Pavey and motorcycling celebrity Charley Boorman. BMW Motorrad motorcycles have won the Dakar Rally six times. In recent years BMW Motorrad have enjoyed renewed success at the Isle of Man TT Races. Prior to 2014, the last success in the solo categories at the event was in 1939, when Georg Meier won the Senior TT. After 75 years BMW again took top spot on the rostrum at the 2014 Isle of Man TT when Michael Dunlop piloted a BMW S1000RR to first place in the opening Superbike race. Michael Dunlop then rounded off the week with victory in the Senior TT. At the 2016 Isle of Man TT, Michael Dunlop again took the honours in the opening Superbike TT for BMW. Dunlop led the race from start to finish from another BMW rider, Ian Hutchinson. Dunlop also established a new outright lap record, at 133.962 mph (215.591 km/h)and set a new race record of 1 h 44 min 14.259 s, after 226 miles (364 km) of racing. BMW sidecars also had numerous successes at the TT Races, primarily during the 1960s and early 1970s. In total, BMW have won 34 Isle of Man TT races, in both the solo and sidecar divisions. ^ "BMW Group Creates Two New Divisions". BMW Group. 27 September 2007. Archived from the original on 23 February 2009. Retrieved 2009-01-15. ^ a b "BMW Motorrad achieves record sales for the fifth time in succession in 2015. Deliveries 10.9 % above previous year as of December. BMW Motorrad strategy takes effect". Archived from the original on 2016-09-27. Retrieved 2016-09-26. 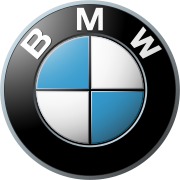 ^ "BMW Celebrates Production of Its Two Millionth Motorcycle". autoevolution.com. 13 May 2011. Archived from the original on 19 May 2011. Retrieved 13 May 2011. ^ Downes, Andy (11 November 2015). "New BMW G310R roadster revealed". Motor Cycle News. Archived from the original on 1 February 2016. Retrieved 30 January 2016. ^ Sunny, Ken (12 November 2015). "TVS-BMW G310R 'Made in India' naked street motorcycle unveiled". International Business Times. Archived from the original on 5 March 2016. Retrieved 30 January 2016. ^ "Berlin Plant". Manufacturing Facilities. BMW Group. Archived from the original on 2008-12-11. Retrieved 2008-09-18. ^ Ash, Kevin (January 30, 2012). "Legendary design chief leaves BMW". Motor Cycle News. Archived from the original on May 2, 2012. Retrieved July 15, 2012. ^ "David Robb leaves BMW". Visordown. January 30, 2012. Archived from the original on February 4, 2012. Retrieved July 15, 2012. ^ Madson, Bart (January 30, 2012). "Running on Fumes". Motorcycle USA. Archived from the original on February 1, 2014. Retrieved July 15, 2012. 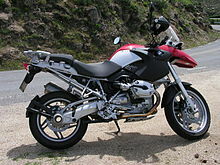 ^ "BMW Motorcycle Sales for 2009 and Prospects for 2010". webBikeWorld.com. 5 February 2010. Archived from the original on 13 May 2010. Retrieved 18 February 2010. ^ "BMW MOTORRAD ACHIEVES RECORD SALES YET AGAIN IN 2007". Biker Voodoo. Archived from the original on 2008-05-06. ^ Ziegler, Jessie. "BMW G450X – New thinking from a new player in the dirt bike market". Motorcyclist. Archived from the original on 29 December 2008. Retrieved 2009-01-07. ^ "KYMCO Ships 450cc Enduro Bike Engines to BMW". China Economic News Service (CENS). 3 July 2008. Archived from the original on 21 February 2009. Retrieved 2009-01-09. ^ "BMW's radical 3-wheeler on its way". Visordown. Archived from the original on 21 February 2009. Retrieved 2009-01-09. ^ Brisette, Pete (15 December 2008). "2009 BMW G650GS Review". Motorcycle.com. Archived from the original on 30 January 2009. ^ Madson, Bart (2 July 2010). 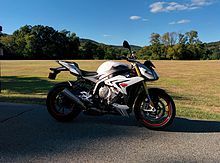 "2011 BMW K1600GT First Look". Motorcycle USA. Archived from the original on 5 July 2010. Retrieved 22 July 2010. ^ Organisation, A.S.O. - Amaury Sport. "History : Dakar". www.dakar.com. Archived from the original on 2016-09-19. Retrieved 2016-09-18. ^ "History of Dakar - RETROSPECTIVE 1979-2007" (PDF). Dakar. Archived from the original (PDF) on 2010-06-01. Retrieved 2009-01-07. ^ "Dakar Rally Winners (Bike Category)". MotorSports Etc. Archived from the original on 27 December 2008. Retrieved 2009-01-07. ^ "News & Reviews - Carole Nash". carolenash.com. Archived from the original on 2018-03-26. ^ "Michael Dunlop wins historic Isle of Man TT Superbike race for BMW Motorrad". www.press.bmwgroup.com. Archived from the original on 20 December 2016. Retrieved 9 May 2018. ^ "Current Isle of Man TT Lap Records - Isle of Man TT Official Website". www.iomtt.com. Archived from the original on 28 August 2017. Retrieved 9 May 2018. ^ "Machines - Isle of Man TT Official Website". www.iomtt.com. Archived from the original on 23 August 2017. Retrieved 9 May 2018. 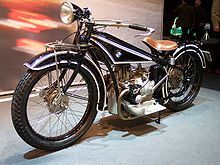 Wikimedia Commons has media related to BMW Motorrad.